A do-it-yourself high heel shoe chair can be custom built with little to no carpentry skills and a few supplies purchased from a hardware store or online. Building this chair is a fun project that can be brought to completion over the course of a single weekend. The assembly makes this chair a great family venture, as there are several steps that can be completed with your kids' help. Building the chair yourself also allows you the opportunity to choose the colors and decorations that best suit you. High heels are no longer just for feet. Place the planter right side up on a flat surface. The diameter across the center of the opening should be 28 inches. Find two points on the circumference of the planter that are exactly 20 inches across from one outside edge of the planter to the other, and mark these points with your marker. Find the spot on the circumference that is exactly between these two spots and mark this with your marker. Turn the planter over and find the spot on the base directly above the center spot you just marked. Mark this place on the base. Draw a straight line from the point on the base to each of the side points that you marked. This planter will serve as the seat of your chair, and you will need to cut out this segment to add the backrest. Cut out the segment of the planter you have just outlined with your miter saw. Place your 44-inch by 20-inch plywood sheet against the planter at the spot where you have just removed a segment to ensure that it fits properly. Make adjustments with the saw as needed. Once your fit is correct, place the board on a flat surface. Flip the planter onto the side you have just cut out and glue it to the base of the board, stacking some books beneath it if it will not stay up on its own. Allow the glue to dry for 24 hours. Turn the planter back over so that it is once again upside down. You should now have something that resembles a high heeled shoe without the heel. Make the top of the heel with the 20-inch by 20-inch plywood sheet. One edge of this sheet will abut the edge of the backrest, and the other must by rounded. Round the edges of one side of your 20-inch by 20-inch sheet with your miter saw. Place your wooden post where the heel of the shoe should be. Set the 20-inch by 20-inch plywood, with the rounded side facing to the back, on top of the post. Make sure the edge of the sheet is abutting the backrest. Glue all of the pieces into place, applying the wood glue generously, and allow it to dry for another 24 hours. Your frame is then ready to be upholstered. Place the butcher paper on a flat surface and outline the foot and heel of your shoe on the paper. Cut these pieces out and set them aside. Wrap the heel of the shoe twice in batting and secure the batting with staples. Wrap the backrest with the batting four times to create a cushion and secure the batting with staples. Wrap the front of the planter twice in batting and tuck the edges of the batting underneath of the planter, securing it with staples under the planter, at the top of the planter and at the back of the shoe. Trace the seat pattern onto the batting and cut out five layers to make the seat of your chair. Place this batting on the seat and staple it into place. Trace the seat pattern onto the back of your upholstery fabric and add 30 inches to the radius to make a large circle. Place the large circle on the seat, right side up, and fold the bottom edges under the planter. Fold the back edge of the circle to fit the seam it meets the backrest at. Staple the fabric to the underside of the planter, and glue it along the seam at the backrest. 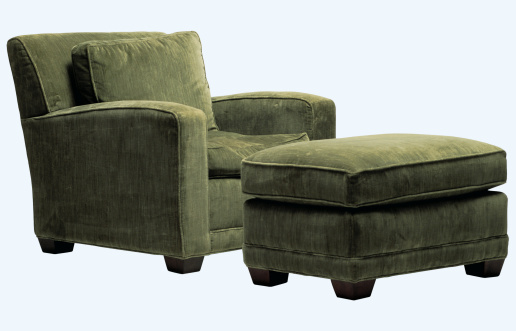 Measure and cut your upholstery fabric to fit the backrest of the chair and the heel. Secure the fabric into place with staples and glue. Make sure that your seams are at the underside of the backrest and the inside of the heel so that they are not visible when you are finished. Trace the foot and heel of the shoe onto the rubber matting and cut out both shapes. Glue them to the bottom of the heel and the planter to make the sole of your shoe. Trim the shoe chair with the piping to hide seams and decorate the chair. Measure a lengths of piping to add to the bottom of both the heel and seat, as well as another around the top of the seat, backrest, and heel. Cut the piping and glue it into place. Allow the glue to dry for at least 48 hours and your chair is ready for use.